Post Tobacco Road half bomb I took some downtime with my running. I didn't run for 7 days and then did two very short (verrrry easy) 20min'ers the following week and everything seemed close to 100%. This past week I ran easy and short and all systems seem to be go and I'll resume a more normal schedule next week. Biking is coming along nicely; I've definitely done more long rides than I probably ever have in prep for anything. 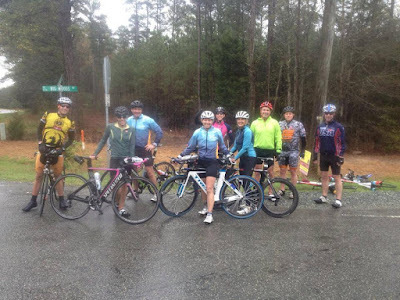 I've done a few 50+ milers, then on Easter a group of us went out in search of hills (in the cool rain, dangit) and got in 62 miles. 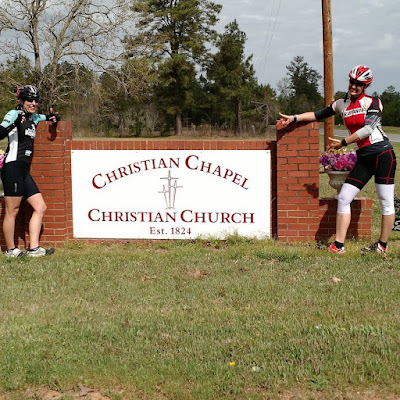 The following Thursday, I took a day off work and went with Carrie and Heather for a 69 miler. Feeling good! We've had Marty's mom in town for the past week which has relieved us of full on parent duty 24-7 and we've been able to do some workouts together. I even got to Fast Friday masters which I never get to do unless we have family in town. Next week, my mom comes in and my sister flies in with her baby the following. I'm looking forward to more family time and more help :) Marty and I might even fit in a real date or two. Logan and Marty came to my work for lunch when he was off school for Good Friday and we ran into the Easter bunny. Which he was scared of until he realized she had candy. A cold wet day for a bike ride. Getting it done. Loved this! Especially the last comment! HaHaHaHa!